(both free and paid for April. I've just revised some of mine which I'd like to share with all of you. First is my Earth Day packet for K-1: You will find a free activity when you download the Preview. Just click on the picture below and check it out. 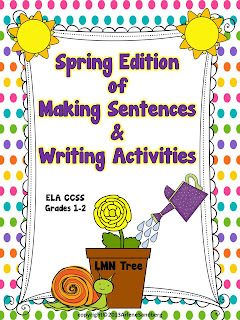 If you haven't tried my Making and Writing Sentences Packet for Grades 1-2 here's your chance to try my Spring Edition. You will also find a free activity when you download the preview! Just click on the picture below to download the preview and see all the activities in this packet. 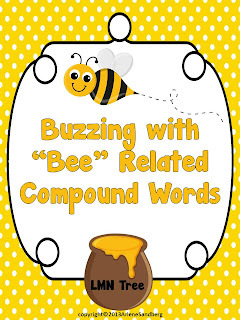 For those of you into themes you may like my Busy Bees unit which I have also revised and added many more activities. You got it- another free product with the Preview file. Just click on the picture below! Working on Compound Words? Here's my freebie for April. Would love for you to leave some "sweet" feedback if you like it! Have your students been reading the "Year with Frog and Toad" books? Maybe you would like to do a unit about real Frogs and Toads. Did you know that Frogs live most of the time in the water but Toads live most of the time on land? Your students will learn a lot about how they are alike and different through reading and writing activities. Do you think their might be a freebie when you download the Preview file- just click on the picture below to find out! How about a free packet Comparing and Contrasting Real Frogs and Toads to Fictional ones? You will find this freebie and other great resources by clicking on the picture below. Don't forget to check out all the wonderful resources at Mrs. Wheeler's First Grade Linky and add your own. Have a great April! All of these products look great, Arlene! Thanks for linking up! Enjoy your day!